Roaches create all manner of problems in whichever environment they invade, and these are among the most common. Cockroaches or roaches forage for food at night and will migrate from one premises to another through sewers and underground drains, or through ceilings. They are known to spread dangerous diseases through contamination of foodstuffs, these diseases include polio, hepatitis, salmonella, hookworm and tapeworm. They are extremely sensitive to vibration and disturbances and will quickly scurry for cover. There are numerous effective measures that one can take to combat Roach infestations. These are a few of the most effective preventative of such measures available in the common household. Cockroaches or roaches are found mainly in kitchens, bathrooms, cupboards, electrical boxes, manhole drains and sewers, preferring dark damp areas, so it is important that these areas be kept as clean and dust-free as possible, at all times. Cracks and crevices in tiles, walls, backs of cupboards, etc should be sealed up, as this will eliminate areas where cockroaches can nest and breed. Kitchen grease is a great attractant and food source for cockroaches, so always check underneath and behind appliances such as the fridge, stove, microwave etc as well as countertops and keep these areas clean. We use a revolutionary Gel bait product that is environmentally friendly, non-toxic and odourless. Designed to eliminate small and medium sized Germanica cockroaches inside the premises. This Gel application will take some time to take full effect as it works on a bait system. The cockroaches are attracted to the gel as a food source and are poisoned after eating even a tiny amount. The Gel has a secondary poisoning effect and cockroaches are cannibalistic. So the live cockroaches will eat the dead cockroaches and also be poisoned. The Gel remains effective for long after the treatment date. Cockroaches breed every 28 days, so juveniles that hatch after our treatment will also be eradicated. We’ll spray any accessible manhole cover drains with a residual insecticidal roach spray as a knockdown for the large Americana cockroaches that live in the drains, if applicable. The maximum benefit of our cockroach control systems will be obtained if basic hygiene standards are achieved and the premises are kept thoroughly clean at all times. Should you have a sub-floor or crawlspace underneath your premises, or a warehouse or archives where the cockroaches are breeding, we can use a thermal fogger to pump a thick white smoke-like chemical into the area. It dissipates into every crack and crevice and is a most effective knockdown in an area of this nature. We can also use our special canister foggers which achieve the same knockdown effect in ceilings, small rooms, etc. There’s a limited residual value to fogging. 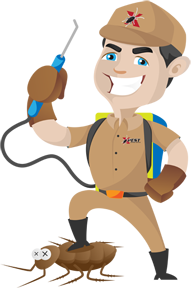 Due to a well-established track record and the experience of our staff, XPEST CONTROL SERVICES is fast becoming a recognised name in Gauteng. This is both due to effective marketing, and a high standard of customer service, which has lead to the progressive growth in positive word of mouth. We take pride in our achievements and strive to continue improving for the benefit of our clients.